PAM: Hi everyone. I’m Pam Laricchia from livingjoyfully.ca and today I’m here with Jennifer Andersen. Hi Jennifer! PAM: It’s so wonderful to have you on the show. Jennifer is an unschooling mum of two and she is the founder of ourmuddyboots.com as well as managing an active Facebook page. I’ve really enjoyed reading her blog for a few years now. I have ten questions for you Jennifer so let’s dive in! JENNIFER: That sounds awesome. Thank you so much for having me here Pam. I really am happy about it. I was hoping you could share with us a bit about you and your family and how you came to unschooling. JENNIFER: Yeah, sure! I’m a very unlikely homeschooler and even less likely unschooler, looking at who I was 15 and 20 years ago. I have two kids. Owen just turned nine about a month ago and Sydney is about to turn seven. You know, when Owen was born, my husband and I—well, me more than my husband—had a vision of what our lives would look like and it didn’t involve our lives changing very much. So, you know, Owen was going to sleep in his own bed and his own crib in his own room from the first night and, of course, that changed as soon as we met him and really understood that he was a person. For the first six or eight months of me being a mother I really struggled because everything everybody was telling me was not in line with what I felt like I needed to do for my son. So, I had some pretty significant post-partum depression when my son was born. There are a lot of factors of course but a lot of that was because of the disconnect I felt between what I thought my baby needed and everybody telling me that that was wrong. We really hit a lot of our attachment parenting choices from the beginning just to keep those critics at bay so I could try to focus on my son as he got older and moved through the toddler years. Then we hit school age and we were so connected, sending him to school just did not feel right. It felt like it was going to break that connection that we had. All that personal work I had done to be able to honour our relationship just felt like it was going out the window. I am not kidding when I say I didn’t know there was any other option. So I drove around for a little while and then I did go back and get him. That was our introduction to the school world. So we pulled him out of school. We kept telling everybody that he was just too young. He was. I put him in when he was really young. So he would just stay with me until we found something better. You know, a year passed and two years passed and then he became officially school-aged. At that point I just kept telling people that he had missed the cut-off date. Which really was true, it was by a week. I had pushed to get him into kindergarten. I think it was that fall that Owen should have been in kindergarten this wonderful friend of mine, Vanessa, I met though an attachment parenting playgroup, I think. Oh, actually, right before that, one fall afternoon, Sydney was almost three, Owen almost 5. We were standing in this beautiful New England fall day. They were riding their bikes on the road, such a gorgeous afternoon. It dawned on me, you know, “I think there are some kids that don’t go to school. I think they’re called homeschoolers.” It was so foreign to me that I just had no idea. Then I met my friend Vanessa and she introduced me to unschooling and radical unschooling. I had no idea how we were going to do it or how it all worked, but that’s where I felt we had finally reconnected with the first four years of Owen’s life and that was the direction that we’d head in. So that was our beginning. PAM: That is wild. It has so many similarities too, with mine, as I listen to people’s stories. It’s so interesting. I had that same: the first few years as a baby and toddler, that disconnect between all the messages I was getting BUT this person in front of me is giving me real messages. PAM: I can tell that’s not going to work for him. You can feel all the whispers, over your shoulder, “She’s spoiling him. She going to blah blah blah.” So, there was that. I had never, ever, heard the word homeschooling. So, my kids went to school. It wasn’t until my oldest was nine, and I only came across the word searching online. Like there was nobody here in Canada that was doing it. I mean, nobody that I came across anyway, in any of my circles. It’s fascinating how everybody comes to it, isn’t it? JENNIFER: It really is. You mention those whispers. Sometimes they aren’t whispers. PAM: That’s true. You have to work to keep them at the whisper level, right!? JENNIFER: It is so true, so true, yes. Let’s skip forward a few years. I would love to hear about what your kids are up to right now, what they’re interested in and how they are pursuing it. JENNIFER: Yeah, sure. So, both of my kids love doing science experiments or sciency things so we’ve been starting our day off with something along those lines. Owen likes Legos. It’s not one of his most favourite things but he does like to play with Legos. He really loves music. Not so much creating it with an instrument himself but he loves to learn about the inspiration for different songs. He loves to look at how it all comes together and what technology is used to do that and what it sounds like with technology and without technology. So we have been looking at that together on You Tube and live music and festivals and that kind of thing. But Owen’s big thing is gaming. He’s a huge gamer. That was definitely a tough one for me to get used to and to really embrace with him. He loves it and he’s really good at it. There are so many cool elements to gaming that I never could have appreciated. Right now, he is in the process of creating his own video games so he’s been working on the story line for it for the last, I would say, six months, he’s been working on this storyline. We’ve been doing a lot of that together which has been fun. Now he’s thinking ahead to, “Ok, I’ve got this storyline, what do I need to know now to make this happen?” So he’s looking at, “How much of this can I actually do myself, you know, coding, programming, voices, that kind of thing?” versus, “How much am I going to have to look for other people to come in and do that for me because the efficiency of me learning to do that isn’t in line with how quickly I want to finish that?” So that’s how he has been pursuing his gaming. Sydney, my daughter, who is almost 7, she, is a creator. She loves to create. She will use anything to create art, sound, anything from glitter to leaves to… we just did this little activity, we tore up a bunch of paper that had stuff written on it and she just took a bunch of tape and recreated this bird out of it. It’s so cool to watch her. I’m not particularly creative in that way, so it’s been so fun to watch her. She also loves board games, so we’ve been doing a lot of board games. I know you have a podcast, Pam that I haven’t listened to yet, about that. We have been having fun playing a lot of board games together. PAM: Oh, you guys will get some good ideas there too. I was really excited. I have some things on my list for the kids, after that episode. The other thing I wanted to point out. Just thinking about the gaming again, because I just finished this month’s Q&A episode. Gaming really is a question that we get asked over and over again. It’s very understandable because technology is so new, right? Somebody posted something talking about the prejudice that we can feel for our children’s activities, technology, digital activities, because it is just something so out of our experience, right? Our children’s childhood years are so different than ours. I think that’s why it’s so hard for us. We all have this image in our head of what we imagine childhood to be like. Similar or not to our own, but none of our imagination included all the really interesting technology and gaming and visual media and stuff that our kids have now. It understandable that it takes work to see the value in it, but there is immense value there, isn’t it? JENNIFER: There really is. So many of us do, but I so relate to everything you just said, Pam, I really do. I love that word, “prejudice.” I have so much prejudice against it that I’m trying to work through and in the last six months I’ve started to truly see the value in gaming and that was a huge shift that really took away a lot of that prejudice. I love that idea of thinking even back to our own childhoods, what messages we were given. You know, the age of watching so much TV and having so much available was new when I was a child. We just had so much of it. That pull, maybe for our parents too, of the value of being outside or reading a book and now we’re in front of a screen. You know, for how many years was that prejudice ingrained in us, that there was no value in it whatsoever? I love thinking about that. That’s so interesting. PAM: The other piece I wanted to mention, just because maybe it will remind me to put a link in the show notes. When you mentioned your son’s interest in gaming, and developing how he wants to proceed with developing his own game. You know, it really depends on what part it is that they find fascinating. You hit that on the head. You know, which parts are worth my time investing in learning how to do? So I know, for my son, the story has always been the most important piece, which lends itself to visual novel kind-of games. In the last six months or so I came across some software for developing visual novels that will make it easy for the person who has a great story and wants to implement it, to take care of the technology side, so I will put a link for that. PAM: Just another piece to help people see how many facets there are. It’s so fascinating. That leads nicely to this next question. As we move to unschooling we come to see that learning really does happen everywhere, and in fact it seems to be something that we learn over and over. You mentioned even in the last six months it’s happened for you. It happens to me too. I know just a few months ago, I felt that, again, a few months later you realise, oh my gosh, I know this even more deeply now. And I thought I knew it completely before. I was just wondering if that had been your experience? JENNIFER: Yeah, definitely. We’re still at the beginning of all of this, my kids are almost seven and nine, so they are still young and at the beginning. 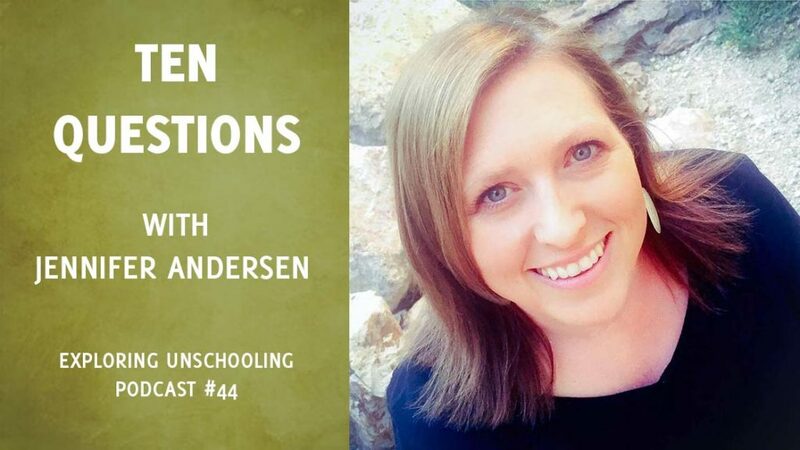 When I mentioned my friend Vanessa first introduced me to the concept of unschooling, it made sense logically. I was on board as much as I possibly could be, but at the beginning I really went on a lot of trust on people who had gone before me and had answered all the questions that I had. Then I’d start to believe it on a little bit more a deeper level from watching them. And then of course when you watch your own child actually experience that…my actual first real understanding of unschooling was watching my daughter learn to swim on her own. Maybe it’s different for every child, I have no idea, but my son Owen was in swimming lessons from the time he was six months old. When we lived in Tucson, Arizona, my daughter, Sydney, was in the pool every day and I was always right there with her but she just learned how to swim, and I don’t know if every child can do that, but for me that was a huge eye opener of “things maybe different than I think they are.” So that deepened my level of understanding. Then watching both of my kids learn to read on their own. That was just the most amazing thing. My background was just a little bit of education, so I was taught to teach kids how to read, so the fact that my kids did it on their own and were learning math and all this stuff… it was that next level of a deeper understanding. Then seeing them connect different things they were reading to our big road trip from last year or to a movie or something. Watching all those connections happen—it definitely deepens as I go, personally for sure. Also, what I love, with those experiences it reminds me of how much I don’t get this yet and how good it is that I have all these mentors that I really respect. You know, you and others, to be able to really understand that what they are saying is right-on and I can trust that and just trust that I don’t get it yet but I will in time. PAM: Yeah, I love that point because I found the same thing too. I think most people can get it on an intellectual level pretty quickly but it’s that next piece…it’s why so often, I was told, and I say to people now, try to give it at least six months to a year, because you need that time to start to really see it in your own children so that your intellectual understanding starts to actually mesh with your own personal experience. Then, man you start to get it in your bones and then if you can give it a year of space and learning and really paying attention yourself, you probably will go through two or three of those cycles and THEN you will seriously trust it. JENNIFER: I believe it Pam. For me there was a tipping point where I realised that if, from us hanging out and doing these things together, my kids were learning these things without me formally teaching it to them. There was a point where I realised: if that’s true, how much would I have stopped them from learning and understanding if I really had instituted that formal teaching policy either by sending them to school or doing more school at home? Once I reached that tipping point, that was where I feel like my understanding, to this point anyway, has really deepened, of the process of unschooling. I’ve really been able to trust it and enjoy my kids more, which has been awesome. PAM: Wow, that is such a great point about that tipping point. That IS a huge piece of the puzzle when that clicks. That, if you’ve given enough space that you can see over time where things go and you can understand: gee, I would have jumped in there and there and I would have pushed it in a different direction. I love your insight that it’s about moving from knowing what not to do to knowing what to do. I was hoping you could share with us some of your thoughts around that process. JENNIFER: Yeah, sure, I went back to when my oldest, Owen, was very young, it was really hard because when I’d be at the grocery store or Target or wherever there was always magazines geared toward parents, of course, and every one of them, inside over and over again you would see: “Five Step” protocols, “Ten Step” protocols, “Three ways to make your kid do this or that” and it was always a one-size-fits-all, do this will all the children of the parents who are reading this particular publication and it applies to everybody. It was always about the child. I never saw one about us as the parent and that was frustrating because none of it ever applied to US. So it got me questioning it and thinking maybe there was something more that I could consider in our relationship than these five-step-protocols. That continued all the way until now. I think anything that you pick up or read, so often it’s just: “Follow these steps and everything will be better.” My experience has been, when I can focus on my kids and put out all those requirements or protocols, that’s when I can really evaluate how happy we are. That can sound so corny—even to the 15-years-ago-me that would sound so corny—to really evaluate our level of happiness, but now fortunately being introduced to this way of living with my kids, I value it so much. It can be a check for me just at any point during the day to see how happy we are all feeling. Not that everything is always, believe me, not in my house, rosy or perfect or anything like that, but it is such a great marker for us. As I have tried to shift from that, I’m moving from an authoritarian way of parenting toward living more respectfully with my kids. The big thing that helped me with that initial transition was thinking about what I didn’t want in our lives any more. I was able to do that by just checking to see how happy everybody seemed. Even asking the kids, even when they were little, different quick questions—not to put the burden of responsibility on them or anything, just to check-in to see how they were doing generally and that kind of thing. By eliminating the things that I didn’t want to do in our home anymore. I am a recovering “yeller.” I wish that my kids had never experienced that, but they did. I didn’t want that in my life anymore. That’s just one example of many things that I didn’t want in our family anymore. So I had to first say, “I don’t want to yell anymore.” Once I acknowledged that I didn’t want that, and I was doing it, just like magic, all these resources appeared to help me stop yelling and to look at things differently. So in my experience, understanding and just saying what I don’t want anymore, really does open the possibility to fill that in with what I do want in our family. Sometimes I don’t even know what that is ahead of time. Sometimes just knowing, “I don’t want to yell anymore,” gets filled in with something, obviously, of course, just so much better than yelling. PAM: I think that such a great way to look at it because it’s so true. So much of our deschooling and our paradigm shifts start with understanding, “Oh gee, look at the consequences of this. That’s something that I don’t want to do.” Yet, we don’t know exactly what we are going replace that with. I feel for them so much. I remember that time when I was learning and learning and learning. You are questioning everything that you’re doing, but as long as it opens you up to seeing what the possibilities are to replace it with. Instead of shutting you down: “Oh I have to stay hands-off. I can’t do anything. I’m stuck here,” and just leaving them on their own. That’s not unschooling either. It’s the connection and the relationship and being together that makes the unschooling. JENNIFER: Moving through that not knowing what to do to knowing what to do, at least in my experience, was when I got those sweet spot moments of our relationship being so connected and really feeling like I got this unschooling thing. At first, those moments were so few and far between. They were kind of like, for golfers, like that perfect golf shot: they’re elusive, but they increase the more that you practice. That was my experience with moving through that period. I’d get that one moment of: this is it, this is what it is: we’re happy, our relationship is so strong and connected, look at how he or she is flourishing. Then eventually moving beyond that, so they made up more of our day than less of our day. We are never there all the time yet. I still have a lot to get over but those moments are so insightful I think. PAM: Yeah, they’re very inspiring and it’s like, oh yeah, that’s what I’m walking towards. The reality is, that that’s what our life is. It is walking towards those moments. There is no perfect life, perfect parent, or perfect person. Life happens and we’re human. That’s what excites me each day, is walking towards the person and the parent that I want to be. All those moments in between that sustain you are awesome. Many of us have triggers that sneak up on us and have us almost unknowingly placing expectations on our children. Maybe at certain events, like hitting school age or the teen years, while for others it may be a seasonal thing as I look out the window and see the first years snow. You recently wrote a post on your blog about how this happens to you in the fall. Can you share how you grew to recognise and move through that? JENNIFER: I had just realised it this past fall, July and August of this year going into this fall, I had just realised that each fall I noticed that my anxiety increases. I noticed that I really come back to that having to fight off in my mind that school-y mindset and I feel a lot of pressure that my kids should be doing this, or they should be doing that. For me, with the stuff that I’m overcoming, that translates into me snapping more at the kids, which is something that I have mostly ceased in our family and it comes back to me being disconnected from them because I’ve got these expectations in my mind that are not in line with what’s really happening in our life so when I feel that anxiety increase and I feel all those expectations come on, I can be pretty sure that there is something else at play. I realised this fall that it had been happening every fall for the last four or five years for me and that the trigger was, “back-to-school”—all the commercials on TV and my whole Facebook feed. Everybody is preparing their child for school with backpacks, lunches, uniforms, clothing and stuff and we weren’t doing any of that. It was a trigger I hadn’t recognised until this year. I was so grateful to recognise that’s what it was, because for me, now, as soon as I recognise it, so much of the pressure just falls away. Once I can realise what’s causing it, so much of it goes away. I also recognised this year that it had been happening in such a big way for so many years that probably fall was a really important time for me to get myself surrounded with some people whose way of life I value. Whether it’s online groups, for us, the Free To Be Unschooling Conference that happens every fall now is huge for us. That’s something that we have really come to rely on as a family. When June, July and August roll around, we know that we have that coming in late September, early October, or have, I don’t know if it will happen again. We have really used that as a place to recharge and be around people who are living in a way that we hope to, or are, and being surrounded by that community helps after I have identified the trigger to bring me back to our reality instead of the one that is happening on my Facebook feed, and happening on TV and happening on the shows that we watch. PAM: That’s a great point, and it ties back to being perfect. If we can recognise that when things are challenging for us, not to berate our self but to be compassionate and understand and find the tools that help us move through those moments rather than having those expectations on our selves, not only on our kids, but also how they’re on ourselves. PAM: I found over the years, that became one of the really strong clues for myself, that, “Oh…something’s going on,” is when I started having expectations of my kids, when the vision in my head wasn’t aligning with what I was seeing and I was expecting different things from them. Eventually I came to see that was usually my clue that I had some work to do, that I had some figuring out to do. I follow an author who calls it comparisonitis. JENNIFER: It’s true. I’m a recovering “people pleaser.” I know a lot of us are, but it’s something I’ve been working on, so comparisonitis—that’s so prevalent. Doing this work on myself I never realised how much of a part of me it is, but it is a tough one. Natural consequences are a frequent topic in the parenting world yet often they are really talking about contrived consequences. I was hoping you could talk about how you see the difference between those two things. JENNIFER: For me, it took me some time to get here. For me, a natural consequence is just something that happens without human intervention or parental intervention in the parenting scheme of things. A contrived consequence is something where we manipulate the outcome for whatever reason is, to teach a lesson, or whatever the reason is we manipulate the outcome. An example of that, somebody on my Facebook page just asked if there was a post that listed a bunch of “natural consequences” versus “contrived consequences.” At the end of the thread, she said, “Well I could probably put this list together myself.” And I said to her, “I’m sure that you could,” because once you get it, it’s there. PAM: In reality, the consequence is the same, it is all in how we participate. It’s the motivation behind it, because really, we are setting them up. In a contrived consequence we are manipulating, as you said, the situation to set them up to, quote “learn a lesson” or something. JENNIFER: (Laughter) Yes, absolutely, all day long. PAM: Yeah, I wish and hope that my husband and my parents and my friends would help me as much as possible, so why wouldn’t I do that for my kids? JENNIFER: And they do. They do help us as much as possible. I know this is a huge conversation amongst all of us. The idea that if my husband left my sneakers out to get wet, well, I wouldn’t have picked him as a husband, (laughter) if he was going to let my stuff get ruined to teach me a lesson. PAM: It really shows how little respect they have for children as people. JENNIFER: Exactly, Pam. That’s been another great natural or contrived consequence and in so many other areas it’s been such a good check point for me when things aren’t feeling quite right, I check in to see if this is what I would say to my husband, sister or friend. It’s been a really helpful checkpoint for me, thinking that way. Unschooling is about living together with our children not about having all the answers. It’s ok not to know what to do and in those moments our children get to see how we move through them. That’s a really valuable skill to show our kids, right? JENNIFER: Mmm, it is. I’ve moved though this in so many different ways in my family and again I think it’s one of those things, I don’t need to contrive any of it (laughing) because I have enough real life examples happening in our world to show them that. Not that that was the right way to handle it, or anything at all, but being honest in that situation, Owen appreciated my honesty rather than the alternative which would have been my anxiety increasing and maybe lashing out in different ways that weren’t really about the issue. He appreciated that I was not trying to burden him with what I’m learning but he appreciated the fact that I was trying to learn. Or if my son and daughter have a struggle or situation come up, I frequently will say, “I don’t know what the answer is here. I don’t know. I don’t know what to do here. Can we take a breather and do something else while I just try to figure out how we can work through the solution?” Sometimes, that, in and of itself, just takes care of whatever the situation was. I find that personally empowering and I hope that my kids do too. PAM: I think that on one level it really helps us to get to know each other better and to understand each other’s perspectives which helps us more and more to better next time work through those situations, work through challenges when somebody wants us, because you better understand the other person’s perspective and you know what? Our kids are smart and they are good at this. So many times my kids have been able to point things out for me. They can eventually say, “Hey I can see your going down this way, and how about this…” or they know just the right thing to say to help you shift–there’s the right word–to help you shift and see things! JENNIFER: It is so true Pam. Those moments I think are both beautiful and humbling and kind of awe inspiring when your own child, at young ages, can look at you and say, “Mom, is this happening for you right now?” and it does shift things. It is amazing. It’s amazing. PAM: I know. It goes back to what we were talking about before about not thinking kids are capable. That’s the thing too, not to expect that they can do that, but it’s just being open and honest and empathetic and admitting—and you can tell from your kids reactions if they’re starting to feel burdened by it, because that is not the point. You’re trying to share information and experience. You’re not trying to put anything on them. You can play it by ear as in, if you start to see that it’s putting any weight on them, you know not to do that but that’s all learning about each other, right? JENNIFER: It is. The other thing, I feel like for me personally, I don’t know if this is others’ experience, but for me personally I came a point, especially when I was recovering from yelling, I could only say sorry so many times. I could only look into their face and say sorry so many times without really realising I was not making the effort I needed to not have to burden them with even that part of it anymore. PAM: Because they’ll pick it up, you know. They can tell, well, this is happening over and over and over. It’s like we’re stuck in a cycle. It happens to them, it happens to us and it’s a great clue that it’s time to try something else. It’s so interesting. They’re pretty fabulous, unschooling kids, aren’t they? JENNIFER: Oh my gosh! It’s so cool. It’s such an awesome thing to watch or be a part of and observe and all of it. They are awesome! You are the founder of the website ourmuddyboots.com as well as maintaining an active Facebook page for that group. I was wondering if you could share how you weave unschooling and your work together. JENNIFER: Yes, sure, so sometimes I will go out to a coffee shop just because I enjoy it and do some writing or some blogging on my Facebook page or whatever but mostly I’m doing it right alongside my kids while Sydney is working on an art project and Owen’s playing a video game. I’m sitting next to him on the couch or whatever. It’s been cool because they’ve been interested in a lot of what I’m doing, maybe not the topics a lot of times but creating a meme. Owen, actually both kids, are getting into photography. Watching me edit my photos and then put some text on them, he’s been really interested in that and has started to do that on his own. It easily fits in and is just kind-of part of life. PAM: That’s really cool. Yeah, it’s like, working side-by-side, everybody doing what they are interested in. JENNIFER: Exactly, see they know that I’m passionate about it and they know that it is really an outlet for me. The whole combination of it. In the down-time I often prefer to do this over watching TV or even reading a book, so it’s my kinda hobby with them. PAM: I think that’s great and it’s one of the things that sometimes we might not think is so important. What we think of, we want our kids to live this unschooling life, but I think it’s important to realise that we want to live that lifestyle alongside them. We want to be that shiny example of the person living and learning and doing the things they are interested in, right alongside them so that they see it in action. You know what I mean? I’m not being raised this different way, to be something different than my parents because sometimes that can get in the way. JENNIFER: You talked earlier about the deepening understanding of all of this and what you just talked about Pam, over the last six months, has been one of the understandings that has deepened hugely for me: that idea that us enjoying our life is important and that doesn’t have to be defined by what the magazines say we should be doing for “me time.” Enjoying life is very different from that “me time” requirement and that has been such a big shift for our whole family when I understood that. PAM: I’m going to include a link because I had that realisation two or three years ago, I wrote a blog post about that. I find that whole idea fascinating of: “You need your me-time.” On one hand it’s true, but you don’t need it to be separate. The thing is, if you understand a need for it to be separate you can explain it and have that conversation. It’s not a separating thing; it’s a connecting thing. JENNIFER: Sometimes, maybe more so when they are babies, or not, depending on what they are going though, sometimes requiring yourself to take that me-time actually has the very opposite effect on you because you don’t want it. You don’t feel like it’s the right thing. You know, I hate having my hair done, I get it done but I don’t like going. That’s not me-time but a lot of magazines tell me that should be my me-time. Especially if I’m leaving my daughter when she’s upset, there is nothing invigorating or fulfilling for me, about me having my hair done while my daughter is upset. PAM: Exactly! We were talking about the messages we get especially when our children are younger and it can be crazy how separating those things are. Question number nine. You are recently back from speaking and playing at the Free To Be Unschooling Conference which you mentioned a bit ago, in Arizona. I was hoping you could share something about your experience. JENNIFER: Well, we had never been to any homeschooling conference before the first Free To Be a few years ago. We’d never been around so many radical unschoolers so that first one, and the two after, but that first one was so empowering for my husband and I. Mostly for my husband. My husband is not a big reader, he’s not a Facebook guy, he doesn’t listen to podcasts, so he was getting all the information though me, about what we were doing. That first Free To Be was when I really watched him become empowered as an unschooling dad. The shift in him from who he was the day before we arrived to who he was the day after we left was monumental. It really was. He was so much happier. He was so grateful and so much more connected. He got what we were doing more. He understood it. He got to hear from grown unschoolers and he got to talk to other dads and it was just such a huge experience for all of us and especially for him. Every year now, as I have mentioned, it’s really become a highlight of our year and something that we really rely on to be in that community and to just be reminded of why, Chris and I, my husband and I are putting in all this personal work to overcome a lot of our stuff. To just see all these kids treated really, as people, or mostly treated as people. It’s just such a cool experience and just so hopeful and so empowering. The gratitude that we both feel toward Jen and Mike McGrail is just immense for putting that together. They do such a nice job. They really do. They make sure there are great funshops for the kids and a speaker for everybody. We just love it. PAM: It is amazing to see it in action with people, isn’t it? JENNIFER: It is! (Laughter) It’s surreal. You can’t imagine what that looks like until you are there. PAM: I remember. As I said, I knew nobody that homeschooled, let alone unschooled, and nobody locally. I remember, I guess the kids had been home for almost a year and a half and it’s like, “Ok, I want to see some of these people face to face” because it had only been online that I had discovered groups and stuff. So we drove from Ontario down to South Carolina to go to our first unschooling conference. JENNIFER: Oh my gosh! That is awesome. It’s true. It was the same for my husband. He had the bits that I had kind-of explained but he didn’t have the interaction even of the online groups and stuff, so it was wonderful for him to see that people were doing it and that the kids were cool and to see the parents and the kids interacting with respect for each other. The nice thing about it is that there is not really a lot of expectations there. As in, you can go to a conference and be yourself in that if you love connecting with people and talking and everything, there are opportunities for that. If you’re a quieter person, more of an introvert, you don’t have the stares at you, like “Why are you weird?” or whatever. It’s such an accepting environment, isn’t it? JENNIFER: Oh my gosh, Pam. This is one of the things, after that first Free To Be, when people asked how it was, you know, the people who really wanted to know how it was, it’s one of the things I said to them: Understanding or being in this environment of living this way, I got this understanding of how much bigger it is than whether kids learn to read or write, you know? JENNIFER: This whole lifestyle is exactly what you describe. We had friends whose children really mostly stayed in their room the whole time they were there. And you know what? Everybody thought that was just fine. Nobody even thought about it. It was just fine. It was so cool and it’s one of the things I most love about this lifestyle, just that idea of being who you are which is so talked about widely but I had never been exposed to anybody living it before. PAM: Exactly. So often you hear it as words, but with unschoolers you really see it in action. It’s beautiful, right? JENNIFER: Now I’m getting tears and goose bumps because it really is, Pam, it is so true. PAM: I know! I have goose bumps too. Question ten! Looking back now, what for you so far, has been the most valuable outcome from choosing unschooling? JENNIFER: Like, talk about deepening understanding. Like, what a cool name when you first heard it. And after you are through being there, then, Chris and I are like, “Oh, Free to be, I get it!” It’s not rhetoric. JENNIFER: It is. It really is. PAM: Thank you so much for taking the time to speak with me today, Jennifer. It was so much fun. JENNIFER: Thank you so much, Pam. I really appreciate it. PAM: That’s great. Before we go, where’s the best place for people to connect with you online? JENNIFER: So we do have an active Facebook page, Our Muddy Boots, and the blog is ourmuddyboots.com. I’m trying to move over a little more to Instagram and Twitter and those are both Our Muddy Boots also. Just before we end, I wanted to just thank you too, and several other mentors, who have been so helpful for so many of us. Truly, the going back to that beginning, not knowing which way to go, or how to feel supported. The work that you and others do has just been so instrumental in this shift for my family. I’m so, so grateful. PAM: Ohhh, thank you so much Jennifer, that’s sweet. Thank you again and I wish you and your family a wonderful day.